Each year, the Duke Master of Engineering Management Program welcomes students from all over the world. That global perspective gives our students a competitive advantage. They choose Duke because of the personal support students receive, the flexibility we offer so that students get the most out of the program, the many resources available to students, and all the things Duke has to offer outside of the classroom. Academic Advisor: a program professor who advises on topics such as course selection and academic preparation for your desired career. Career Advisor: a career specialist who assists with career exploration and your job search, including assistance with resumes, cover letters, and interviews. Read more about career services. Student Services: staff who focus on student needs and activities, including acclimation to Duke or the United States, performance on school work, or overall concerns about health and well-being. Academic Services: staff who serve as a resource for academic planning, including course registration and graduation requirements. Program Options: The program can be completed in two semesters by taking four courses per semester, but many international students extend the program to three semesters for a variety of reasons. We offer checklists for getting the most out of the program with either option. Deferring Admission: Admitted students may request to defer admission to a future term; please contact us for more information. This is a good option for international students seeking more experience before joining the program. Preparation for academic success: What is expected in the classroom? How can students best leverage resources within all of Duke Engineering and Duke University? What skills are required for effective engagement with peers/teams/faculty? Preparation for career success: What path can a student pursue? What skills/experiences/knowledge will realistically position them for their objectives? What alternatives approaches/opportunities exist? Promotion of global awareness: How can students better connect with and learn from one another? How can diversity issues be recognized, examined, and discussed? What value comes from a global educational experience and cross-cultural awareness for students? for employers? Intercultural Effectiveness Scale (IES) Workshops: People who are interculturally effective are proven to be more effective leaders. They are far more likely to inspire trust in their team and therefore inspire others by better understanding their values and motivations. For today's engineer, global leadership is not an optional aspect of a career path, but a critical skill that will be necessary for success. In this required workshop, students explore the six major facets of intercultural effectiveness: self-awareness, exploration, positive regard, global mindset, emotional resilience, and relationship interest. Students examine their current level of intercultural effectiveness and develop a plan for maximizing existing skills and behaviors and identify potential areas for improvement. Cultural Values Workshops: One of the greatest things about Duke's Master of Engineering Management Program is the diversity of the student body. Students come from a variety of geographic locations, religious backgrounds, ethnicities, and communication styles. While these differences are appealing on paper, they can lead to issues with group work, negotiation, and community building. In our cultural values workshop, students gain a better understanding of their own personal values and the various ways those values affect how they deal with others. This is often a particularly enlightening workshop for domestic students, who may have not had a lot of intercultural interactions prior to graduate school. English as a Second Language (ESL) Course: Those students presenting some challenges with verbal communication (as assessed through a required interview) will be placed in an ESL course. The course involves weekly meetings in which students practice practical communication skills such as basic conversation, networking, interviewing, and presentations. We believe that that this model provides our students with a more practical approach to communication skill building and a safe environment to build communication confidence. Duke Student Clubs: Duke University is home to 400+ recognized student organizations, including over 100 clubs dedicated to various cultures. International Orientation: Held for one week prior to the program's standard orientation for all new students, I-week is dedicated to helping international students settle into life at Duke. International House: With a mission to provide educational services and advocacy to the international population at Duke as well as outreach to the Durham community, Duke's I-House offers extensive cross-cultural programming and information to enhance the global mission of the university. Visa Services: Offering information on everything from the incoming visa process to Curricular and Optional Practical Training (CPT and OPT),Visa Services works with departments to issue visa documentation for students. Student Affairs: See the Student Affairs site for Duke-wide centers plus additional tips on settling into life in the United States for international students. The Duke Master of Engineering Management experience goes beyond the classroom. With hundreds of student activities, including competitions, technical clubs, volunteer opportunities, social activities, athletic pursuits, and a vibrant arts scene, Engineering Management students have plenty to do when classes aren't in session. Student Leadership: Program Development Committee members work with the program's leaders to plan student activities, coordinate student recruitment events, and enhance industry relations. Typical social activities have included International Foods Night, Community Service Days, Basketball Campout, Graduate School Mixer, Movie Nights and Sport Competitions. University Competitions: Engineering Management students have a tradition of excellence in entrepreneurship competitions like the Duke Start-Up Challenge, a business plan competition. To date, students have won over $500,000 to support their entrepreneurial efforts. Read more about entrepreneurship. Going Green: The Duke Smart Home is a 6,000 sq. ft. live-in research laboratory designed, operated, and occupied by students exploring sustainable living, technology integration, and design. 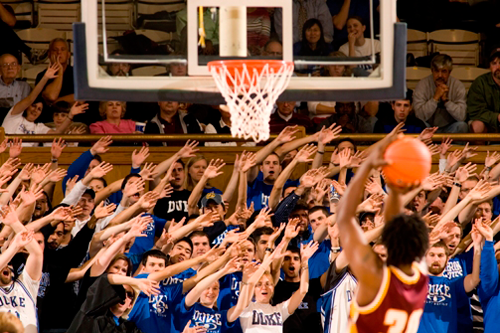 Duke Basketball: Engineering Management students are crazy for Duke athletics. Below, our Cameron Crazies cheer on the Blue Devils. Duke Groups: To browse all Duke Groups visit dukegroups.com. Our video, Choose Your Path, highlights the Master of Engineering Management (MEM) and Master of Engineering (MEng) programs and their differences for applicants. Which path will you choose?